A High 5 Stars! Deeply Passionate Read! Vivienne Lorret’s This Season’s Original Series just gets better and better. I’m totally addicted to this series and can’t wait for the next book! This Earl is on Fire is a captivatingly, deeply passionate, roller coaster of a read. This story is well deserving of 5 stars. We are first met by the Pimm’s family who open their door to find a man slumped on their stoop. He’s been horribly beaten up and unconscious. The Pimm’s, with the help of their butler, drag him inside. Their daughter Adeline is taken by him and feels a deep sorrow for this poor soul at her door step. After bandaging him up and settling him into their guest room, Adeline visits with him and tries to help settle his pillow and after he awakens tries to give him a drink of water. It’s the sound of Adeline’s voice that gives him any relief from pain. Adeline soon learns that the gentleman in her families care is Liam Cavanaugh, the Earl of Wolford. Once Liam learns that Adeline is a debutante he instantly pushes away from her, for he fears getting suckered into marrying her and he wants nothing to do with marriage. He’s avoided it successfully for many years now. Adeline, however, also does not have marriage on her mind. She and her family have come from the countryside and her parents would love for her to find her mate, however, Adeline just wants adventure. Her whole life she’s spent trapped in her bed due to her deformed shortened leg and she wants to experience what life has to offer. However, she had no idea that she’d find adventure in the form of a dashingly handsome and scandalous Earl, nor did he bargain on finding this quiet country lady so captivating and begin to feel his heart drawn to her. Will Liam open up his heart to the beautiful Adeline? Will Adeline find not only adventure but love too? Lorret’s writing is impeccable, she keeps the reader attached from the first page. The characters are well developed and well-rounded, I felt that I could relate to these characters and soon just fell in love with Adeline and Liam. The plot is filled with twists and turns and the scenery makes one feel as if they are really there. A truly remarkable read that is part of a series but can be read as a stand-alone. I highly recommend this book and this whole series! This whole series is on fire! 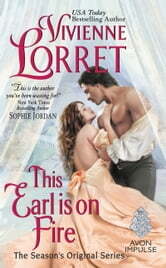 This Earl is on Fire is the second book in the 'Season's Original' series by Vivienne Lorret. I have had the pleasure of reading the first book, but it certainly isn't necessary to have done so in order to understand and fully enjoy this second book. This is the story of Miss Adeline Pimm. She was born with one leg shorter than the other and has to wear an especially adapted shoe in order for her to walk with more ease. She has lived in the country her whole life, and has been wrapped in cotton wool by her parents and all who know her. She finally convinces her parents to go to London so that for the first time ever she can take in the sights and sounds, the balls, the parks, just everything. Her parents believe she wants to go in order to find herself a husband, but all she wants is to be able to spread her wings and have the freedom that up until now she hasn't been allowed. Her first taste of freedom comes on the very first morning of her time in London. When the family were ready to go out they opened their front door only to find a badly beaten, unconscious gentleman falling into the foyer. Despite what society might say, in fact, caring nothing for it, the family, having no servants yet, managed to carry the man upstairs to one of the bedrooms where Adeline took it upon herself to clean the man up and nurse him. She was alone in a room with him for many nights, in itself a bigger adventure than she had ever had. The man in question is Liam Cavanaugh, the Earl of Wolford. He's worked hard to earn his reputation as a rake. He was hurt badly many years ago when he found out the woman he thought loved him, was only marrying him for his title. He knew that kind of thing went on, but never dreamed it would happen to him. Since then he's hardened his heart and like Adeline, isn't interested in marriage. Oh he knows he has to produce an heir, but he figures he will marry some young thing when he is 60, and will give no thought to it until then. When he spends days healing under Adeline's care, he comes to enjoy her voice, loves her scent, and especially loves a stolen kiss they share before he is well enough to go back to his own home. Once he does that he misses Adeline terribly, but will he let his past dictate whether he pursues her. And if he does, will he be able to convince her that marrying him wouldn't mean losing her independence? He can't even believe he is thinking of marriage, after all, he is a long way for the planned for 60 years of age. As well as thinking of Adeline and their possible future, he also has to worry about who it was that attacked him and why? Why are his homes being burgled and yet ridiculously small things only being taken. He has a huge collection of very expensive artefacts and yet they aren't touched. Why rob a house and not take at least a few very expensive items? What are they looking for, and is he in further danger. If he is in danger, then so is Adeline if he pursues her. What is he to do? Can he love her, can he keep her safe? Can he even keep himself safe? This book is one that once you start reading it you won't want to put it down. Adeline and her family are such sweethearts, and from the start you fall in love with them. Liam definitely needs a family like theirs in his life, he has been hardened to all things beautiful, and it is so refreshing to him to be with people who genuinely care about other people. Of course along with the possible courtship of him and Adeline there is the mystery about his attack and the break ins of his homes. I was shocked to find out who was actually behind it all. I love when I can't guess a culprit! All in all this was a thoroughly enjoyable story and I fully intend to read the next in the series. Vivienne Lorret is an author who is definitely on my favourite authors list. I was given a complimentary copy of this book in exchange for my honest review. 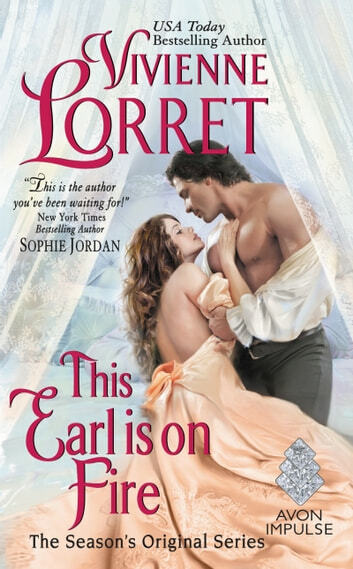 This Earl is on Fire by Vivienne Lorret! Sheltered all her life by loving parents, Miss Adeline Pimm is determined to prove that she can stand on her own two feet. What better way to do that than with a London season where she feels she is fully prepared to make this an adventure; her only concern is her secret coming to light. A secret that has her determined never to marry. A secret that she feels elicits pity and/or repulsion. What Adeline isn’t prepared for is family myth affecting her in a way she is not prepared to explore when a bloodied, unconscious man lies at her door. Liam Cavanaugh, Earl of Wolford, has led a self-imposed lonely life. A life that only has room for many homes filled with artifacts, few friends, and a scandalous reputation. A reputation that seems to have caught up with him when he awakens in an unfamiliar room, battered and bruised being nursed by someone with her voice alone soothes his pain. As Liam’s body heals the barrier he has erected around his heart starts to crumble; however, an innocent remark threatens to cement that barrier back in place. When the reason for his attack puts Adeline’s life in danger Liam realizes what the most important thing in his life is but will he be able to convince that person of his change of heart? The Earl is on Fire is the second book in Vivienne Lorret’s series - The Season’s Original but can be read as a stand-alone. The story is written in such a way that I felt every emotion of the characters, from Adeline’s determination to prove herself and her frustration at being coddled to Liam’s hurt from his long ago betrayal and desire to be. Ms. Lorret’s secondary characters are written with depth (not just space filler) without taking away from the hero and heroine and giving hints as to where the next story may lie. The heart to heart between Adeline and her mother had me in tears. I enjoyed the book (and am looking forward to the next in the series) and would recommend to fans of the author, new readers and lovers of historical romance in general. Adeline's tender heart will not allow her to look away from a soul in pain. When she comes across a wounded man in her doorway, she doesn't think twice of the danger to herself. She cares for him, gets to know him and falls hard. Liam, has no idea who the woman with the sweet voice and gentle hands is. Nor does he know what happened to him and why. His one thought is that his soul is lighter than ever and his heart is falling fast for this serene woman. Unfortunately, just because you don't remember doesn't mean the danger has passed. Ms. Lorret, blends adventure, suspense and seduction into a story of love that has unforgettable written all over it.